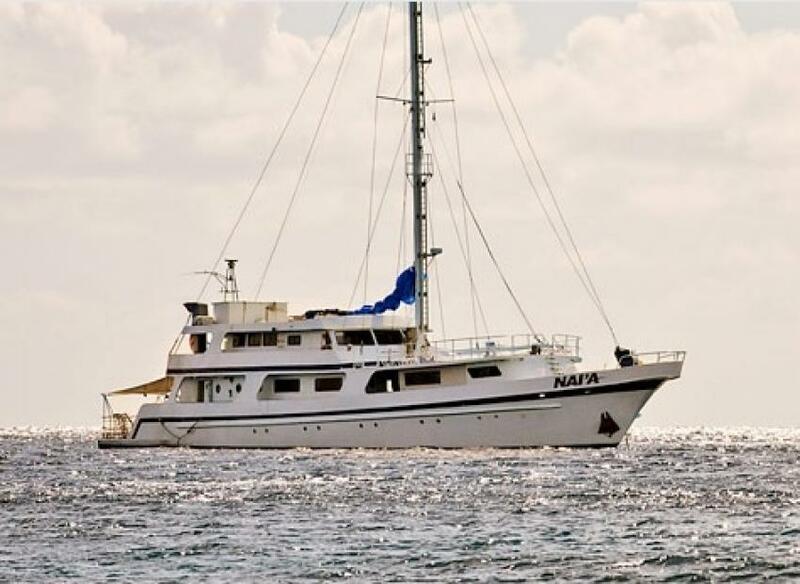 Nai’a is a comfortable liveaboard that offers diving on Fiji Island and whale watching on Tonga, truly unique itineraries. Nai’a Liveaboard can welcome 18 passengers on board. All 9 cabins are en-suite, has air conditioning, additional wardrobes. There is a possibility to choose rooms with double bed or converted twin beds. Also, you can share a cabin with another diver, there are staterooms with one double and upper twin bed and a cabin with twin bunk-style beds. Time from dive to dive on evenings onboard passengers can spend in the salon. It is spacious and equipped with entertainment facilities. Also, divers and their fellow travelers can use theater on a board of Nai’a and large sundeck, perfect to enjoy the view. The living area is spacious, boasts guest will appreciate big windows and nice interior of it. Nai’a Liveaboards dive deck is big, have storage facilities and hanging area for wetsuits. Crew team will take care of filling a tank for you during the trip. There are also facilities necessary to maintain equipment after the dive and a hot fresh water shower on dive deck of Nai’a. Boat supplied with nitrox membrane and offer also other gas mixes for divers with certain certification. Your safety on a board of Nai’a is ensured by special equipment. Boat equipped with first aid kit, emergency rafts, life vests, etc. Nai’a is a perfect liveaboard for marine photographers. For them, the boat offers a separate camera room with large table and storage boxes. For quick camera rinsing, there is a freshwater tank. Nai’a outfitted with a big screen and several charging points. Nai’a Liveaboard offers two main itineraries for passengers, the Fiji Islands, and Tonga. Dive sites that boats visiting on Fiji are first of all triangle Lomaiviti, Bligh Water, and Namena. This place is full of coral reefs, and barriers that represented by a diversity of fish. Namena Island diving features with strong currents, that is good for drift dives. Also, divers can see lots of soft corals here, meet white tip sharks, groupers, and nudibranchs. Fiji Islands suites for experienced divers and also for beginners. Another itinerary that Nai’a offers is whale watching in Tonga. This area is a point for humpback whales migration. A daily program usually features with spotting, observing, photographing and swimming with whales. Fiji is a year-round destination. Best conditions for diving in this region is October to March. Water temperature and visibility are the best at this time. Whale watching in Tonga is possible from July till September.